I thought about a few more flavor combinations for my little dessert creations and went tropical on one, traditional on the other. 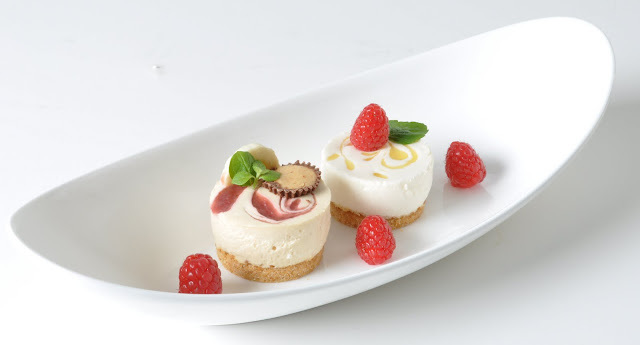 I love pineapple and coconut, and those flavors come together perfectly in a "Pina Colada" so here's that combination in a little cheesecake, topped off with some mint and a raspberry, just because it looks pretty. The traditional flavor is on every American Child's list of favorite foods "Peanut Butter and Jelly" so I chose to do that as my traditional flavor. Topping it of with a slice of banana to give a nod to ELVIS favorite, a deep fried peanut butter and jelly sandwich stuffed with banana. Soon, hopefully these will out somewhere for everyone to try.